Usually, I get uneasy when I read the word ‘professional’ integrated into the name of any product. Why? A lot of expectations are raised when a product is pushed as a professional-grade product. High expectations. First, the product has to handle volume. Second, the product has to produce professional-level quality. Third, it has to last quite a while. You see, there’s a wide gulf of difference between ‘standard’ products and ‘professional’ products. After all, professionals deliver a service day in day out which has to meet a certain high level of quality. Professionals also have to deliver this service on a volume basis. Given all the qualifications above, it is not a surprise why any ‘professional’ products attract a higher level of scrutiny and skepticism. The Russell Hobbs 21370 Steamglide Iron is marketed as a ‘professional’ iron and, for the most part, it meets professional-level expectations. Still, there are some areas for improvement Russell Hobbs can pay attention to so they can roll out a truly topnotch product. 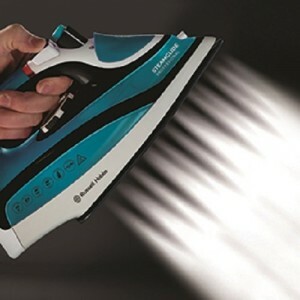 When it comes to most kinds of steam iron, steam and heating power are non-negotiable. 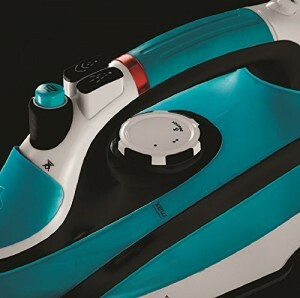 While a limited exemption or leeway can be made in the case of cordless, light travel irons, for regular irons, much more professional-grade irons, steam generation volume and heating power are crucial. Thankfully, when it comes to these criteria, the 21370 Steamglide Professional Iron does quite well for most loads. However, if you see yourself handling heavy volumes, this model might not be the optimal choice. Powered by 2600 watts, this unit can deliver quite a bit of heat. 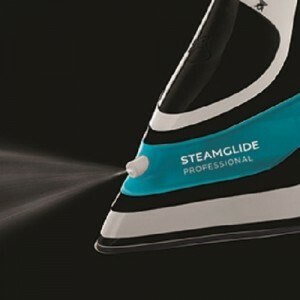 When it comes to knocking out deep creases, you not only have to have a lot of steam, that steam has to be of high enough heat. This unit definitely has the heating power needed to produce a very hot head of steam. As far as steam blasting is concerned, this unit produces a continuous steam stream of 40 grams per minute. That is a very good volume of continuous steam. Paired with high heat, such steam volume should be enough to produce very smooth fabric surfaces. However, if you come across some particularly tough spots with very resistant wrinkles and creases, this unit boosts your crease-removal and wrinkle- busting powers with a hefty 145 gram steam shot. While this unit is definitely a great choice for small to medium loads, if you are going to be dealing with heavy loads of clothes or an ample supply of hard to handle or heavily-creased fabrics, this model should probably not be your first choice. 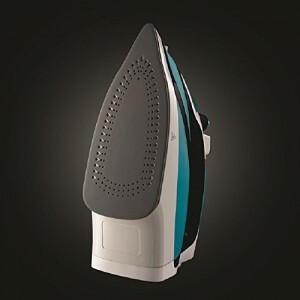 The simple truth is that there are other steam irons on the market that produce more hot steam and at higher pressure levels than this iron. Let’s face it, ironing isn’t exactly one task most people look forward to. I’m sure most people can quickly find all sorts of other activities they’d rather do than ironing. Part of this reluctance is due to the fact that in the bad old days of ironing, most irons had heavy iron soleplates. While these soleplates can get really hot, they are also very heavy. In fact, they would face some (although small) resistance from fabric surfaces. This resistance can add up and if you have a heavy load to iron, ironing can be very time consuming and physically draining. Thankfully, most modern irons have soleplates that glide off fabric surfaces. Your arm doesn’t have to wear out as you move your iron over a fabric’s surface. Of course, not all soleplates are created equal in this department. Some soleplates glide more easily than others. On this count, the Russell Hobbs 21370 does a good job. Actually, it is excellent. It doesn’t take much effort to glide this iron over a surface. While this quality probably won’t mean much difference in terms of time saved and arm stress, this can be a really big deal if you are going to be handling medium-sized ironing loads. 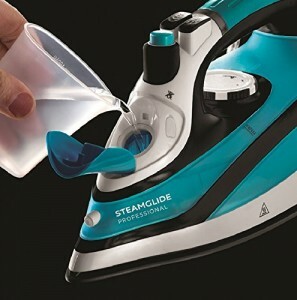 Regardless, this unit’s ceramic soleplate and the ‘gliding’ ironing it produces might make even the most hesitant steam iron user less wary of tackling an ironing load. Weighing in at 1.6K, this unit isn’t exactly light but given its steaming and heating power, this unit’s weight isn’t too bad. There are two constant threats which are ever present with most irons. First, there’s a chance you will pick the wrong setting and end up burning the fabric you are ironing. While most irons have multiple heat settings, many users make the wrong choice and end up applying the wrong heat level. You’re lucky if you pick a heat setting that is too low. This mistake won’t leave you with a loss. However, you’re out of luck if you pick a heat setting that is too high. Depending on the fabric you’re working on, this error might leave a nasty-looking dark mark or might even burn the outer surface of the fabric. Another constant threat is when iron operators get distracted and they leave a hot iron on a fabric. Not only will you have to say good-bye to the fabric but you might also have a fire on your hands. 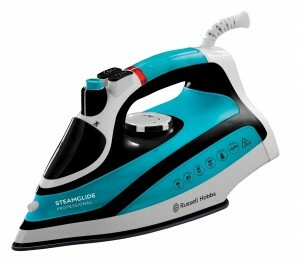 Thankfully, this Russell Hobbs Steamglide model has you covered in the latter situation. If you leave this unit on top of a fabric, it will automatically shut off after some time. This feature can be a literal lifesaver. If you are willing to brush aside the ‘professional’ designation of this project, in terms of overall functionality and quality, the Russell Hobbs 21370 Steamglide Professional Iron brings a lot to the table. Depending on the volume of ironing you normally do, you might want to seriously consider this unit. For standard home use, the factors that make this product look like a winner are its automated shutoff safety feature, its robust heat production and steam power, and its decent continuous steam output. It also features an anti-scaling system which can go a long way in extending this unit’s life.